Antonio Floriani was born in Genoa February 24, 1976. Physician Psychotherapist, admitted to the Provincial Medical Association of Genoa with n. 15196, he is in the list of Medical Psychotherapists in accordance with Art. 3 of Law 56/89 (Italian law). 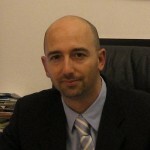 He is Director of the Centro LiberaMente and he works at the ASL3 Genovese (Local Health Service of the city of Genoa). His activities include consulting in clinical (medical and psychological), psychotherapy (individual, couple and family) and counseling, working on a network with other subjects, both private and institutional, according to a systemic and integrated approach. Long experience in social work and security, he specialized in Psychotherapy with a systemic-relational approach and earned the second level University Master in Criminological Sciences. He is expert in addictions (especially drug and alcohol addictions) and collaborates for many years in public facilities and private social services for recovering addicts. He works with families of drug addicts and psychiatric patients through psychoeducational interventions and psychotherapy, with individual and group meetings. He is co-manager in the Working Group “Primascoltare” of the association LHG12 on the family abuser and his taking charge, taking part in the project work on support and assistance of the dysfunctional family, with particular attention to the perpetrator and protection of children involved. He is member of various scientific societies (areas of psychotherapy, addiction, criminology) and he is a board member of the Italian Society of Alcoholism (SIA), Section of Liguria. Organizing awareness events for staff and families about the issue of drug and alcohol-related problems, he promotes and supports the self-promotion and health protection systems such as groups of self-mutual-help. He is author of some scientific national and international works and publications, he has participated in various scientific committees for the organization of training events in the clinical setting and targeted information to operators and citizenship. He has also received commissions as a speaker and lecturer at seminars, conferences and meetings, working at institutional level and at the University as an expert on issues concerning health, addictions and bullying.